The decanter measures approx. 7 ” high. This boxed set has 2 cork stoppers, made up to look like heads. Plaid design on glasses and the decanter. Probably from the late 60’s or early 70’s. Nice to find in the box. To see this item and other fab finds, please visit the Almonte Antique Market, 26 Mill Street, Almonte ON. Just 30 minutes west of the city of Ottawa. Open 7 days a week, all year long, 10am to 5pm. Over 50 dealers in a 2 storey heritage building in downtown Almonte. 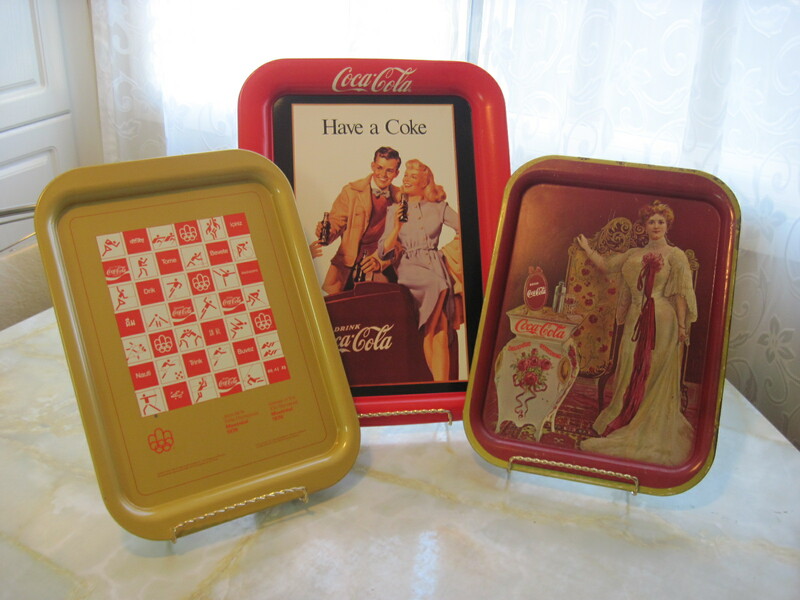 Three nice Coke trays from different eras. The left one is from 1967, advertising Expo 67. The back one is an older 50’s tray and the right one is a reproduction from a very early tray but is dated in the 1980’s. To see these and other Fabulous Finds, please visit my booth at the Almonte Antique Market, 26 Mill Street, Almonte ON. Just 30 minutes west of Ottawa. Open year round, 7 days a week, 10am to 5pm. Over 50 dealers in a 2 storey, 5,000 square foot heritage building in downtown Almonte. 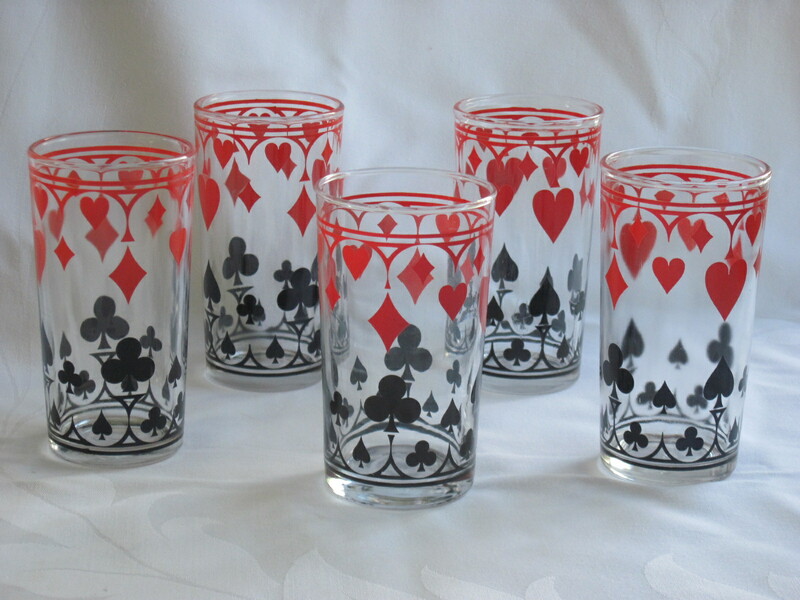 IN THE 1950’S SCHWARTZ BEGAN SELLING PREPARED MUSTARD AND PEANUT BUTTER IN REUSABLE GLASSES EMBLAZONED WITH PLAYING CARD SUITS – ACES, HEARTS, CLUBS & SPADES. 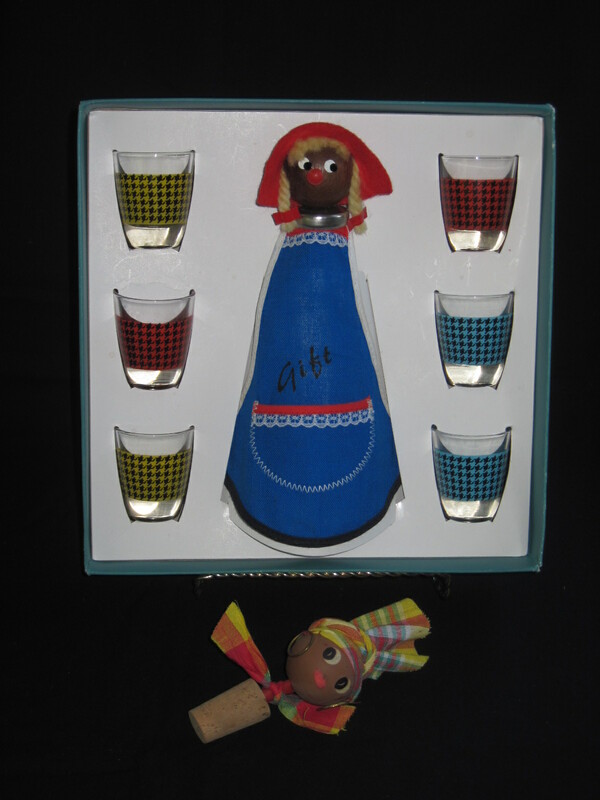 MANY KIDS GREW UP WITH THESE AS THE ONLY DRINKING GLASSES IN THEIR HOUSE, BUT TODAY THEY ARE COLLECTOR’S ITEMS. I certainly remember having these glasses growing up. Almost everyone played cards during that era, which is why these were so popular. These are the taller version of the glasses. They are now much harder to find in good condition. Many people put them in the dishwasher which dulls the painted design. All vintage glasses should be handwashed to keep the finishes nice and shiny. They are priced individually at $ 5 each. Available at my booth in the Almonte Antique Market, 26 Mill Street, Almonte ON. Open 7 days a week, 10 to 5 all year round. Please note: These glasses are now SOLD!!! Mid Century liquor dispenser caddy with 6 shot glasses. The pump works fine, has a swirled red and white bakelite push knob on the dispenser. 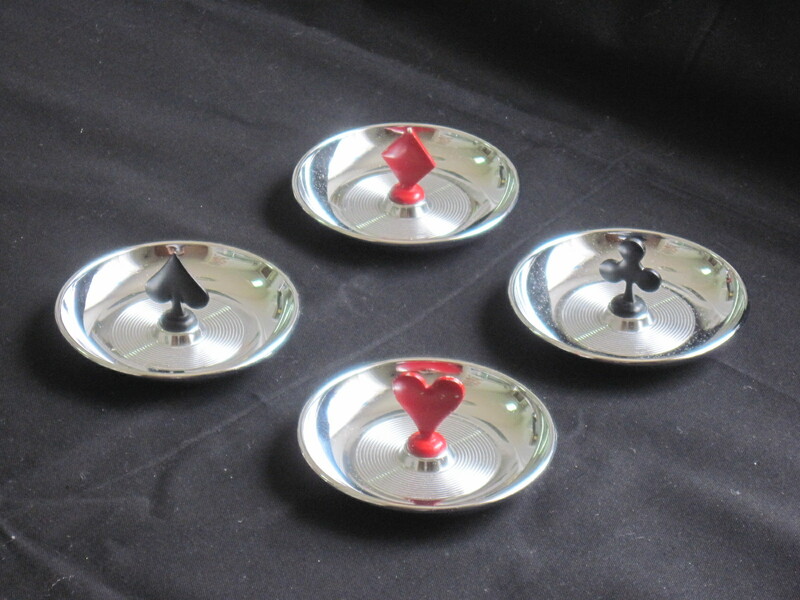 The chrome tray which holds the glasses sits over the neck of the decanter and rotates. This originally sat on a chrome undertray with 3 glass inserts for party snacks. I have seen this item attributed to the Park Sherman Co. of Springfield Illinois US, ca 1940’s and 50’s. 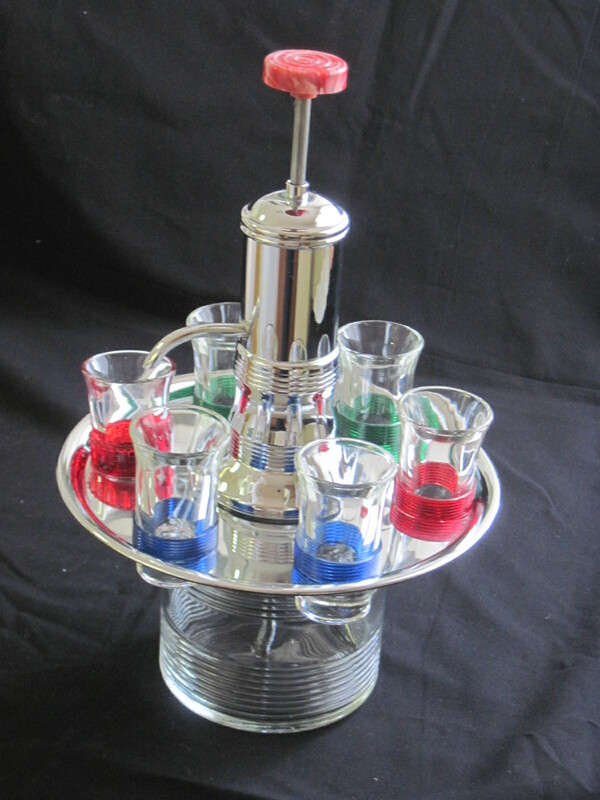 The company made several different styles of decanters and pump action dispensers. Park Sherman was an important Springfield company for several decades ending with the sale of the company to a New Jersey firm in 1960. Sherman operated from the 1930’s through to the 60’s. Best known for their mass-produced smoking accessories, particularly lighters, as well as a multitude of office, novelty, and other items. This item will be for sale in my booth at the Ottawa Antique Show at the Carleton University Fieldhouse Ottawa ON on Oct 25th and 26th 2014. 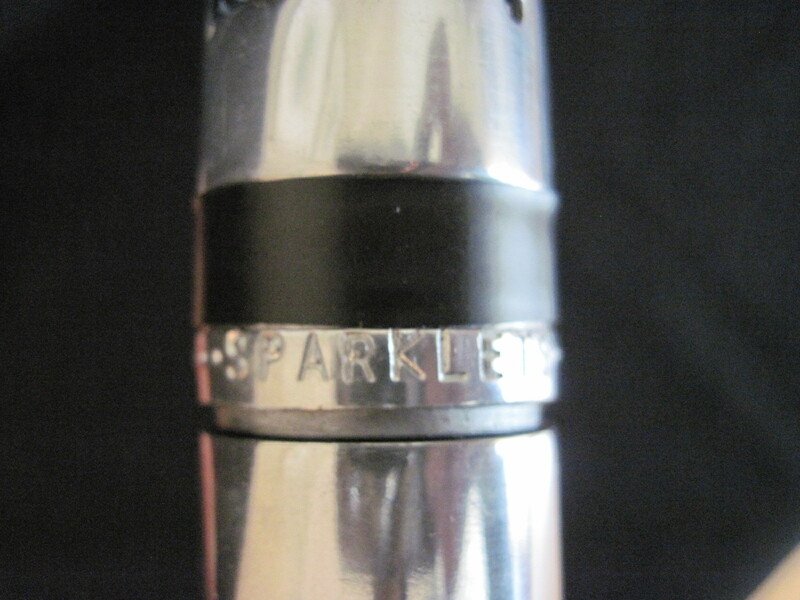 The Sparklets Corkmaster uses a Sparklets Bulb Cartridge which has CO2 gas in it. The Corkmaster is inserted in the cork and when the gas is released, it gently lifts the cork out of the bottle. The gas bulbs are the same ones that would have been used in a Syphon Bottle. 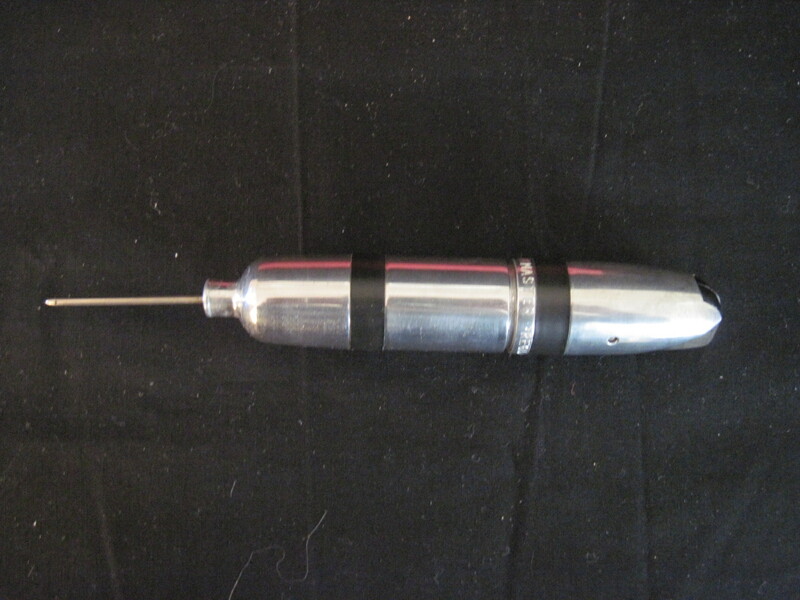 These date to the 1960’s and 70’s and were manufactured by the British Oxygen Company. 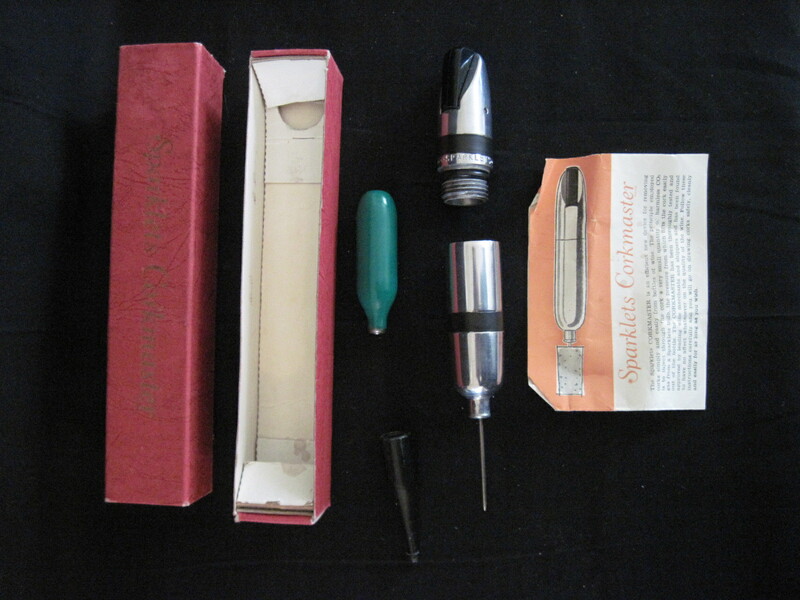 Unique item that would still be serviceable today if you could find the CO2 replacement cartridges. I came across this information on several sites while doing some research on the Corkmaster. How true this is I am not sure……..but it is rather funny. A Bottle Of Wine To Bond And Then Prepares To Open it. The Threatening Look in of the pictures shows Him Ready To Stab The Cork With A Sparklets Corkmaster…….or is he preparing to stab something else???? ?